MACPA held our fifth Leadership Academy on August 26-28, 2015 in Towson. 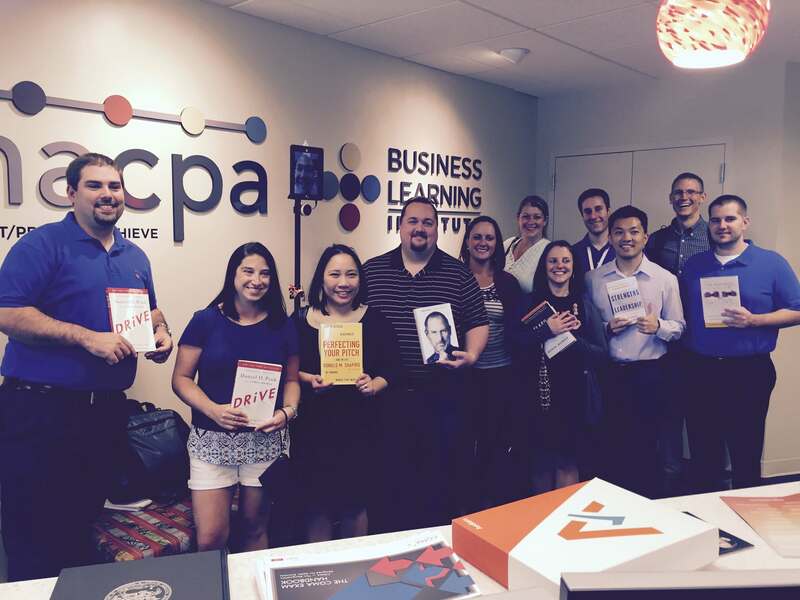 Pictured at left is Leadership Academy particpants at our MACPA/BLI Offices with their book picks from our library. They were treated to a special reception with our current Chair of the Board, Michael Manspeaker, a partner in the firm of Smith, Elliott and Kearns and the soon to be Chair-elect of the American Insitute of CPAs, and past-chair of MACPA, Kimberly Ellison-Taylorand currently the Executive Director of Oracle’s Global Healthcare Practice. This group of enthusuastic emergng leaders were fun to work with and had a mature sense of what business and the profession needs. They worked to identify a series of high leverage opportunities for the Profession and their organizations. With themes around mentoring, knowledge sharing, flexible cultures and my favorite, how to be a strategic informant – an insightful professional capable of advising clients and employers about the future. Think windshield versus rear view mirror. They then created eight powerful questions about the future of the CPA Profession. Take some time to look over these ideas and see if they can help you and your firm become better. I left the two and a half days feeling very encourage about the future leaders in our Profession. Dates for next year have already been set for August 24-26th, 2016. Contact Pam Devine pam@blionline.org for information on how to bring Leadership Academy to your firm or organization.